Streak across the sky with the realistic jet plane. Jump in the cockpit, close the canopy and take off! Operate the retractable landing gear and working ailerons and then sweep the wings back and go supersonic! Its just like the real thing! Rebuilds into a aerobatic plane…. Streak across the sky with the realistic jet plane. Jump in the cockpit, close the canopy and take off! Operate the retractable landing gear and working ailerons and then sweep the wings back and go supersonic! It’s just li ke the real thing! Rebuilds into a aerobatic plane. 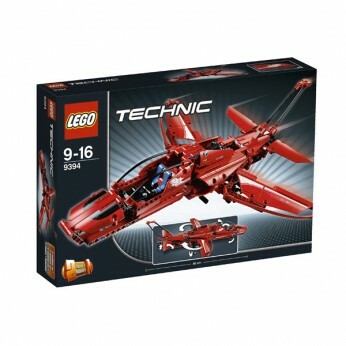 This toy costs approximately £29.99 (for the latest and best prices make sure you check our retailer list for the LEGO Technic Jet Plane 9394 above). In our review of LEGO Technic Jet Plane 9394 we classed it as being suitable for ages 6 years, 7 years, 8 years, 9 years, over 10 years but recommend you check the manufacturer specific advice before purchasing.